MyTunesRSS allows you to access the music and videos from your iTunes library or any simple watch folder over a local network or even the internet. You can access your music from all over the world using a simple web browser. 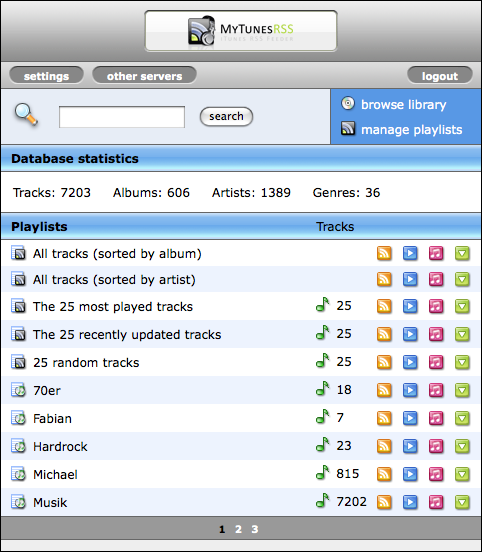 The user interface lets you search for titles or browse your whole library by album, artist or genre. You can access your iTunes playlists or create new ones directly in MyTunesRSS. You can access your iTunes playlists, etc. ...... playlist criteria. Add YouTube videos to your database. This does not add the videos themselves but only the meta information. The YouTube videos appear in the web interface just like all local tracks but they are fetched seamlessly from YouTube for playback. Qweas is providing links to MyTunesRSS 4.1.4 as a courtesy, and makes no representations regarding MyTunesRSS or any other applications or any information related thereto. Any questions, complaints or claims regarding this application MyTunesRSS 4.1.4 must be directed to the appropriate software vendor. You may click the publisher link of MyTunesRSS on the top of this page to get more details about the vendor.